Newspaper is an amazingly dynamic base for mixed media art, adding depth and texture to projects. 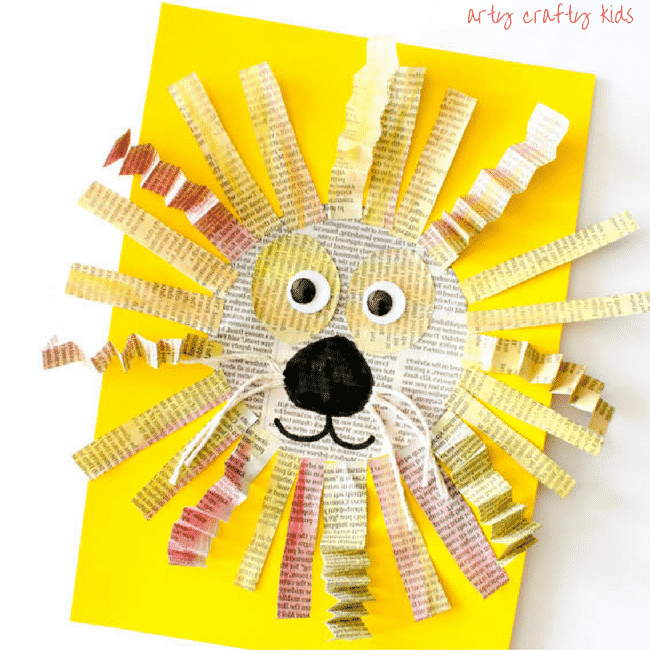 It’s accessible, inexpensive and if you’re keen to try something new, then this super cute Mixed Media Newspaper Lion Craft is a good place to start! With lots of cutting, sticking, painting and folding involved, children will be in their element and while they’re having fun, they’ll also be working on their fine motor skills. A double win, making it a great craft for preschoolers and young children at home or within a group. I had the pleasure of designing and making this adorable Lion for I Heart Crafty Things, who is fellow creative, blogger and friend with an amazing collection of crafts and activities for children on her site! And of course, before you go, we also have an array of animal and mixed media projects that i’m sure you will also love! Here’s just a few of my favourites. Using a combination of newspaper, watercolour paints and yarn, we created an amazing Mixed Media Unicorn! Start collecting the yoghurt pots to create an adorable frog! Combine yarn and watercolour paint for an awesome abstract art project. Use bubble wrap to create awesome pints and patterns. Or take a look at our incredibly popular Cling film Art process that’s great for no-mess creativity, abstract backdrops and for children with sensory issues. I hope you enjoy all the crafts mentioned here today, especially the Mixed Media Newspaper Lion Craft featured on I Heart Crafty Things!